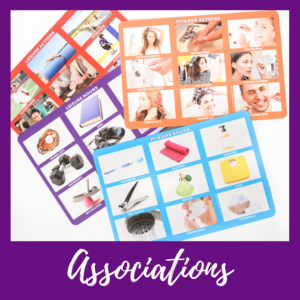 Associations - Students can work on matching items by association. If you pass out the purple leisure noun boards, get out the red leisure action vocabulary cards. You will turn over a leisure action ( i.e. reading), if you have the picture of the book on your board – you match it! If someone else has the book – you can pass it to them or ask “who has the book?” A great way to play for students who understand word associations. 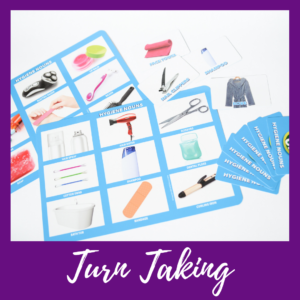 Turn Taking - Double Up allows for practice with turn taking. 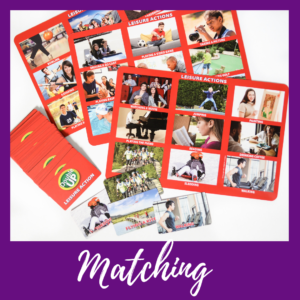 Picking a card and taking your card is a functional leisure skill. The format of this game, allows for many opportunities to take your turn and wait while others take their turn. 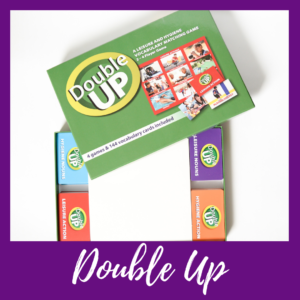 Waiting - If you play Double Up as a 4 person game- your students will have to wait for their peers to take a turn. This is a natural way to work on the skill of waiting. Waiting can be so very difficult for our students and this is a great way to embed work on this skill. Home / Different Roads to Learning / Double Up!